Henry Holt and Co., 9781627794633, 384pp. Stockholm, 1968. A thousand American deserters and draft-resisters are arriving to escape the war in Vietnam. They’re young, they’re radical, and they want to start a revolution. Some of them even want to take the fight to America. The Swedes treat them like pop stars—but the CIA is determined to stop all that. 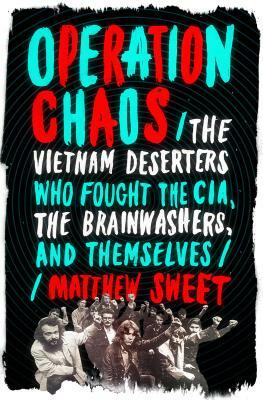 It’s a job for the deep-cover men of Operation Chaos and their allies—agents who know how to infiltrate organizations and destroy them from inside. Within months, the GIs have turned their fire on one another. Then the interrogations begin—to discover who among them has been brainwashed, Manchurian Candidate-style, to assassinate their leaders. When Matthew Sweet began investigating this story, he thought the madness was over. He was wrong. Instead, he became the confidant of an eccentric and traumatized group of survivors—each with his own theory about the traitors in their midst. All Sweet has to do is find out the truth. And stay sane. Which may be difficult when one of his interviewees accuses him of being a CIA agent and another suspects that he’s part of a secret plot by the British royal family to start World War III. By that time, he’s deep in the labyrinth of truths and half-truths, wondering where reality ends and delusion begins. Matthew Sweet is the author of Inventing the Victorians, Shepperton Babylon, and The West End Front. He is a columnist for Art Quarterly and a contributing editor for Newsweek International, and he presents the BBC radio programs Free Thinking, Sound of Cinema, and The Philosopher’s Arms. He was series consultant on the Showtime drama Penny Dreadful and played a moth from the planet Vortis in the BBC2 drama An Adventure in Space and Time. He lives in London.